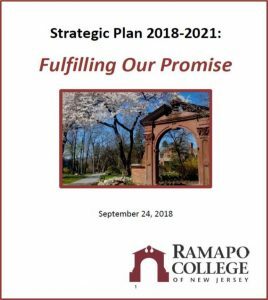 On September 24, 2018 the Ramapo College Board of Trustees endorsed Strategic Plan 2018-2021: Fulfilling Our Promise. Dashboard 2021 demonstrates institutional effectiveness and progress on Fulfilling Our Promise. It was published in Spring 2019 and is updated periodically as data becomes available. The College issued Dashboard 2021: A Visual Mapping of Outcomes and Indicators. On September 24, 2018 the Board of Trustees formally approved Strategic Plan 2018-2021: Fulfilling Our Promise. In December, the College unveiled a preview of Dashboard 2021 as part of its winter Communications meetings. During the summer of 2018, the recommendations of the Task Force on Extending the Strategic Plan were further reviewed and discussed by President Mercer, members of the President’s Cabinet, and the Board of Trustees. The findings and recommendations of the Task Force were largely advanced by these groups and additional decisions were made to strengthen the revitalized Plan. These decisions largely included recognizing “innovation” as an institutional priority and, in turn, the establishment of a new goal to advance innovation. In addition, a visual mapping of the Plan’s associated metrics was developed in a supplemental Dashboard 2021. In the spring of 2018, following the December 2017 adoption of the Report of the Shared Governance Task Force which outlined dynamic protocols for shared decision making, President Mercer, SGA President Lally, and Faculty Assembly President Kwak, met and agreed to establish a Task Force charged with evaluating, modifying as appropriate, and extending the current plan. The charge issued to the Task Force on Extending the Strategic Plan was mutually agreed upon and noted: The Task Force on Extending Strategic Plan 2013-2018 is charged with making recommendations on adding, continuing, modifying, or closing out individual objectives and outcomes within the current Strategic Plan so that the goals may be extended for three years (2018-2019, 2019-2020, 2020-2021). Those recommendations, to the extent possible, shall be documented in a manner that largely reflects the format and ethos of the Plan 2013-2018 (as approved in June 2013). The recommendations were advanced to President Mercer in summer 2018. In the fall of 2017 the progress on the strategic plan was again assessed by the Office of Institutional Effectiveness. That overarching assessment led to plan updates which primarily maintained the plan’s overarching four goals, shifted thinking away from “targets” and toward “outcomes”, and reinforced the importance of efficient and effective mission-driven operations. In Spring of 2016, the College hosted a Community Forum focused on Goal 4 of the Strategic Plan. The forum presented progress on Goal 4, additional initiatives in support of it, and featured breakout sessions for attendees in the areas of diversity training, student success support and barriers, campus climate, and Diverse Learning Environment Survey data. Ramapo College’s Strategic Plan was approved in June 2013. Under the leadership of President Peter Mercer, significant resources were redistributed to meet institutional goals as outlined in the Strategic Plan. In the year and one half since the plan was approved, much has been accomplished. The Strategic Plan Update Report is now available for review, it denotes the progress and challenges associated with the Plan’s 52 achievement targets. Through the leadership of Dr. Dorothy Echols-Tobe, Chief Planning Officer, the implementation of the Strategic Plan is underway. Modeling the highly collaborative and cross-representative approach that was used to develop the Plan, the implementation of the Plan will be guided and monitored through a similar process. The Strategic Planning Implementation Team’s charge is to review Unit Plans re: Strategic Planning Objectives/Target Strategies (52 outcomes/measures), discuss plans with Target Lead Agents, prepare and make recommendations to the Planning Steering Committee; and to analyze recommendations from the Cabinet re: Program Reviews. The Team includes: Nicole Pulliam, Asst. Director, Cahill Career Center; Sandra Diaz, AVP, Institutional Advancement; Stephanie Barlow, Asst. Director, Residence Life; Mike DiBartolomeo, Assoc. Director, Enrollment Management; Thierry Rokotobe-Joel, Associate Professor, Anisfield School of Business; Scott Frees, Associate Professor, School of Theoretical and Applied Science; Missy Long, Counselor, Office of Specialized Services; Stephen Sondey, Director of Purchasing; Gurvinder Khaneja, Director of Instiutional Research; Vinnie Guinta, SGA President; and Dorothy Echols Tobe, Chief Planning Officer. The Planning Steering Committee reviews recommendations/actions from the Implementation Team and forwards them, as appropriate, to Cabinet. The Planning Steering Committee includes: Beth Barnett. Provost and VP of Academic Affairs; Maria Krupin, VP of Administration and Finance; Cathy Davey, VP of Institutional Advancement; and Dorothy Echols Tobe, Chief Planning Officer. Throughout the months of March and April 2013, the Strategic Planning Task Force solicited feedback from the College on the March 1, 2013 draft of the Strategic Plan. During this time the Task Force presented 22 “On the Road” presentations of the draft plan to faculty, staff, and students, and collected notes from 19 of them; received 51 Web feedback forms, 9 emails, and 8 missives; and the draft plan was covered by The Ramapo News in its April 4 issue. Sans the News article’s readership, the SPTF made approximately 600 touch-points throughout the feedback process. What followed was a June 1 draft of the Strategic Plan that was presented to the Board of Trustees at its retreat early that month. With only minor revisions, a final version of the plan, dated June 3, 2013, will be presented to the Board of Trustees for endorsement at its June 24 meeting. 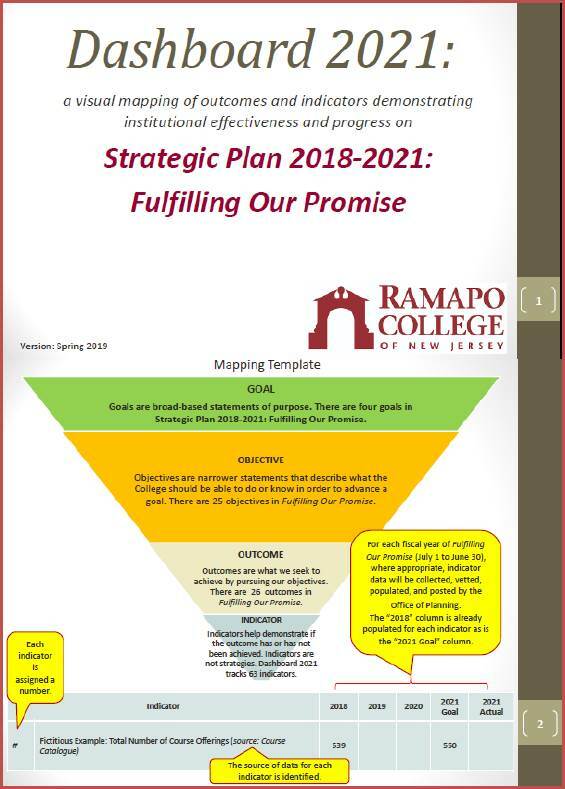 The Strategic Planning Task Force has largely completed its authorship of The Ramapo College Strategic Plan 2014-2018. The Task Force originally convened in January 2012 and has been meeting routinely since that time. During March and April, the Strategic Plan 2014-2018 will be available for College-wide feedback on the plan. During this time, small sub-groups of the Task Force will be taking the plan on the road. These “On the Road” presentations of the plan are designed to provide College stakeholders with an overview of the plan’s development and content, and to collect feedback on the plan’s conceptual and strategic strengths and weaknesses. The “On the Road” sub-groups are available to address small or large audiences from Unit Council meetings to departmental staff meetings. To schedule an “On the Road” presentation for your colleagues or your club/organization, please contact Brittany Goldstein, Office of the President, at (201) 684-7609 or bwillia1@ramapo.edu. In addition, College stakeholders are invited to review the plan online and share feedback via the accompanying online feedback form. Feedback gleaned from the “On the Road” presentations and the online feedback form will be incorporated into the plan as the Strategic Planning Task Force deems appropriate. The Task Force looks forward to your feedback and to presenting the plan for endorsement to the Board of Trustees at its June 24, 2013 meeting. The College’s current Strategic Plan for 2007-2012 comes to a close in June. In September of 2011, the College embarked upon a new cycle of Strategic Planning by seeking nominations for faculty, staff, students, and others to serve on the 2012 Strategic Planning Task Force. At its fall retreat, the President’s Senior Cabinet gathered input from faculty, staff, students and others regarding the most significant issues likely to confront higher education over the next five years and how to engage constituents in the deliberations over a renewed strategic plan. As a result, the Strategic Planning Task Force, a representative body comprised of College stakeholders, will embark on the development of the new strategic plan in January 2012. Adapted from John Bryson’s Strategic Planning in Public and Nonprofit Organizations, the challenge of the 2012 Strategic Planning Task Force will be to deliver a strategic plan that will serve as a management tool to help Ramapo College focus its energy, to ensure that all College stakeholders are working toward the same goals, and to assess and adjust the College’s direction in response to a changing environment. Per Bryson, strategic planning is a disciplined effort to produce fundamental decisions and actions that shape and guide what an organization is, what it does, and why it does it, with a focus on the future. President Mercer will chair the 2012 Strategic Planning Task Force. The Task Force, a dynamic group of 25 individuals, meets regularly throughout the spring semester and hopes to present a final Strategic Plan for endorsement by the Board of Trustees in June of 2012. More information and updates on the Task Force’s work will be forthcoming. If you have questions regarding the 2012 Strategic Planning Task Force, please contact: Brittany Goldstein, Special Assistant to the President, bwillia1@ramapo.edu or Babette Varano, Assistant Vice President of Institutional Effectiveness, Research, and Planning, blanni@ramapo.edu. The Strategic Planning Task Force (SPTF) began meeting in January 2012. The SPTF updated the College at recent Communications Meetings and the Board of Trustees in June. There have been significant achievements, including the SPTF’s endorsement of a revised mission statement. The objectives for each goal are currently being refined and the SPTF continues to meet with the Master Planners and the Master Plan Steering Committee to ensure alignment between the two plans. Implementation, annual assessment, and iterative development on defining and using data to make decisions.